Exploring what it means to be butch is an important conversation to be had in Singapore theatre. Apart from a few notable exceptions, plays exploring sexual identity have been dominated by men. And none of those exceptions are as specific and insightful as what Pretty Butch could be. So imagine my disappointment when the teething problems of Tan Liting’s first full-length play fail to afford us enough bite to chew on this important issue. Her workings on the page—a monologue, two duologues, and a sprinkling of ensemble sequences that are dream-like or absurd—reveal a novice learning from her predecessors. There is nothing wrong with that in itself and, taking the elements individually, Tan proves to be a competent playwright whose writing is engaging, funny, and poignant. However, rather than exploiting these elements to its full potential, her play feels like a mix-tape of what is characteristic of small-scale productions in Singapore. Clearest case in point? Consider the lesbian couple (played by Farah Ong and Shannen Tan) signing up for a prenatal class. The clash with bureaucracy (a three-headed synchronised monstrosity, played by the rest of the cast), which insists that one must go for the “Daddy’s class” while the other, the “Mummy’s class”, and the eventual compromise is a campy nod to The Coffin is Too Big for the Hole. It is hardly a variation on a theme, but merely an addition of curlicues to the treble clef, crochets, and quavers. Thematically, Tan offers variety: a butch (Deonn Yang) facing pressures from society and constantly being mistaken for a man; a couple of guys on holiday struggling with being masculine (Fadhil Daud and Henrik Cheng); and a lesbian couple going through pregnancy, with the “masculine” one of the pair carrying the child (Farah Ong and Shannen Tan). Unfortunately, she could not quite handle the variety and ends up being overstretched. The two-hander with Fadhil Daud’s character struggling with perceptions of being effeminate while Henrik Cheng’s character struggles with gynæcomastia is the worst hit. The only struggle we see is both characters finding it difficult to admit their struggles to one another. That said, Tan should be credited for her perceptiveness in her idea of being butch and this could be a play on its own. Perhaps Handsome Butch or Pretty Hulk? As for the other two stories, they mostly circle around issues of conformity and societal perceptions. Apart from the story about the two men, Tan could not get into the meat of the issues because—as a director—she chose to invest too much time on literal signifiers such as getting the cast to dress and undress. When it comes to the performers, they are the best and worst thing of the production. Deonn Yang is nothing like her character as she gives an assured and self-aware performance. Aside from handling the difficult moments sensitively, she knows exactly how her body is perceived and plays with such perceptions to show the absurdity of societal norms. Farah Ong and Henrik Cheng have the unenviable position of trying to keep the scene afloat as their less-than-stellar scene partners threaten to drag everything down. It is refreshing to see Ong tackle a text-based work after having seen her in a couple of avant-garde productions. In this outing, she showcases her versatility as she spans the spectrum of playfulness, anxiety, and sorrow without overplaying the emotional beats. This is in stark contrast to Shannen Tan, who presents a “duotonous” performance throughout the show. She either tries to connect with her scene partner by focusing on the playfulness rather than the emotional connection, or she tries to be emotionally wrought by becoming shrill and high-pitched. Yet, she is not quite the dead fish because she sheds two droplets of tears in one scene that immediately triggers sniffles in the audience who would think it is a heart-wrenching performance. 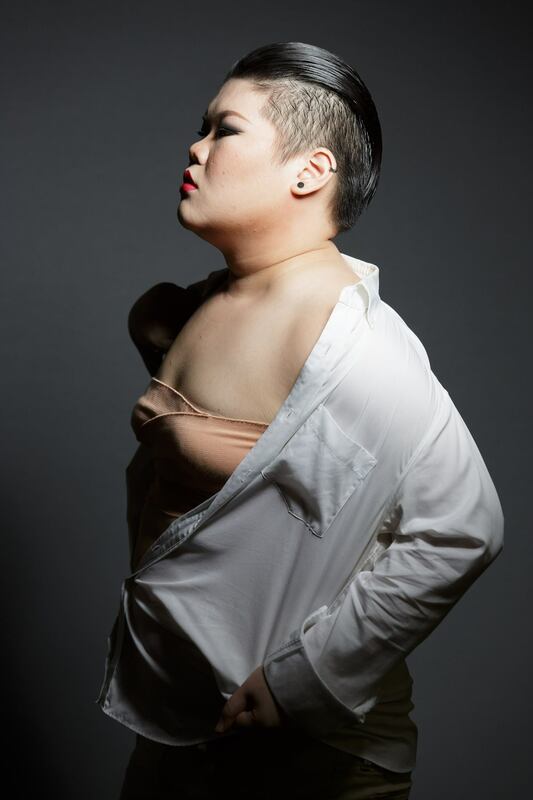 Cheng manages the delicate balance in which his character struggles with a physical condition (gynæcomastia) but, while it does affect his self-confidence, it is very different from the other character struggling with being called effeminate. The playwright does him a disservice by not fleshing out his character a little more. One looks forward to more of Cheng’s work, and hopes that he does not return to New York so soon after his graduation from the Intercultural Theatre Institute. Fadhil Daud’s performance lies on two extremes. For the campy ensemble bits, he plays it to the hilt, and is endlessly entertaining. But for his main role of a young man trying to be masculine, he is as confused as his character as one is never sure what he wants to do with the text. Thus, we are left with him being extremely colourful or extremely bland. Speaking of flavours, my comments may leave a bitter taste, but it is important to note that Tan has a good palette. She just has to choose a couple of ingredients, and cook it well. “Navigating the conflict between self and social perceptions” by Akshita Nanda, The Straits Times Life!